As full-time RVers, we needed a way to connect to the Internet while traveling. Since 2006, I had a Verizon Aircard with unlimited use. It was wonderful but for $70 a month, we opted to drop it when we moved to Ecuador. We have DSL when we are on our property in Tennessee and we hop on to our stepdaughter's WiFi when parked in her driveway in Maryland. But last year we realized we were going to have an issue when parked in Stu's oldest daughter's yard in Delaware. She is a on a pay-as-you-go Internet plan and it was inconvenient for her and us to constantly have to add use. So we've been watching for a good WiFi pay-as-you-go for us, not wanting to sign up for a contract. 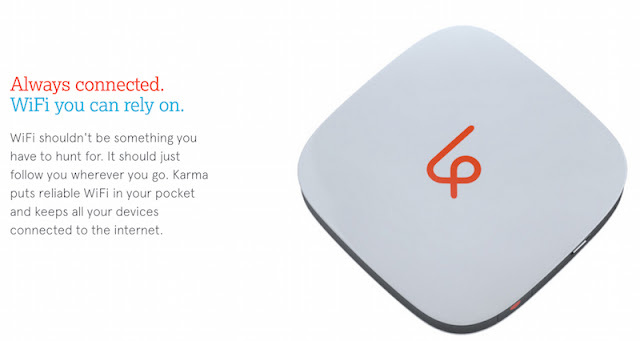 When we read about Karma, it sounded like a good plan for us. When we checked it out a couple of months ago, they were sold out and anticipating having more available in August. Visiting their page a couple days ago, we found that we could pre-order and it should arrive early on in our visit to the states this fall. Of course this is only good in the US and only where they have coverage - and they do have coverage where we need it in Delaware. When you buy data (in GBs), it never expires. At $14 per gigabyte, its data prices are more expensive than some other alternatives , but less expensive than places like hotels and airports that sell WiFi access. We love its "buy it and forget it" model for data usage, which allows you to truly pay as you go for your data.